Considering that we live in the age of binge-viewing, the prospects of sitting through a five-and-a-half hour movie shouldn’t sound so radical. 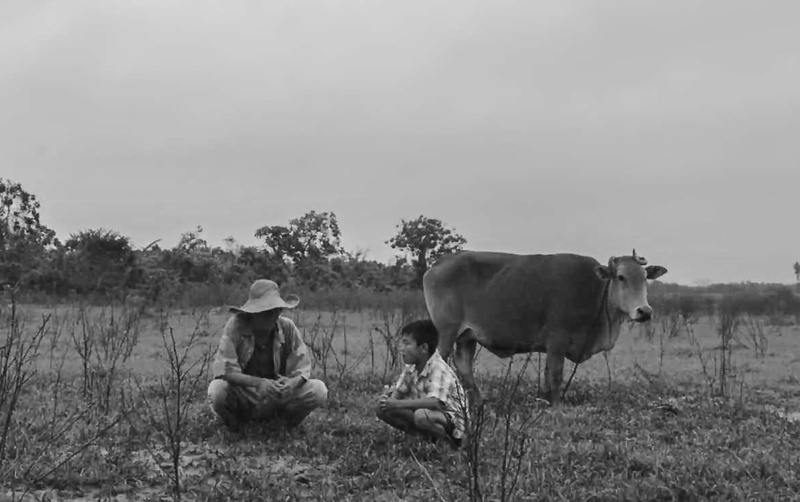 Of course, there are long movies and there are Lav Diaz movies, which apply their durations with such particular aesthetic finesse that one must embrace the challenge to access their unique appeal. “From What Is Before,” the Phillipine director’s latest opus, runs considerably shorter than some of his other features — 2008’s “Melancholia,” for instance, approaches the eight hours — yet rarely does this unconventional form fit its content so well. “Norte, the End of History,” released earlier this year, expanded “Crime and Punishment” to a four-hour epic that used its source material to explore a broader passage of time with compelling but mixed results. The new movie earns every minute. Diaz’s starkly photographed black-and-white drama takes place in a remote village in the early 1970’s, exploring the final days of a tranquil religious community on the brink of collapse. Climaxing with president Ferdinand Marcos’ declaration of martial law in 1972, “From What Is Before” steadily develops a quiet world defined by quaint traditions and the solitude of a barren coastal landscape. In its opening moments, a voice over declares that the ensuing events are “based on real life” but “came from memory,” and Diaz’s gradual accumulation of details justifies that declaration. In the first hour, a world comes to life, enhancing the tragedy when it falls apart. At the center of this remote barrio is a spiritual mindset epitomized by the town’s belief that Josephina, a young mentally ill woman, possesses healing powers. While receiving care from her doting sister Itang, Josephina becomes a greater object of fascination when mysterious events start to afflict the community, including the inexplicable butchering of cows and sudden fires that destroy several huts in the dead of night. The local priest disapproves of residents’ investment in Josephina, but maintains a protective stance over their delicate means of living off the land with limited resources. Though the shadow of the president’s declaration looms, evil creeps into their world even faster from the inside. A wild-eyed wine salesman looks as though he could crack at any moment, while well-intentioned herdsman Sito hides a dark secret from his young nephew Hakob about the child’s missing parents, whom he believes have been exiled to an island of lepers. The truth of their fate marks one of several revelations that Diaz slowly brings into the labyrinthine plot as each hour passes by. Yet despite the breadth of the ensemble, one character looms above all: the location. Setting the action almost exclusively within the barrio’s confines never limits its visual sophistication, as Diaz captures remarkable sequences on open fields and across a majestic beach where the waves constantly whip against hulking rock formations. The endless chaos of nature embodies the abstract threat of imminent destruction; by imbuing these shots with a combination of mystical allure and darker possibilities, Diaz creates a haunting atmosphere that makes it possible to absorb the story even when it slows to a crawl. There’s a liberating quality to his patient approach. The director often pauses for scenes of extended beauty, including a haunting lamentation performed in the wake of a woman losing her child, and countless monologues involving the themes at play. Since the movie explores the cryptic developments of a small town captured in black-and-white, it’s easy enough to find some rudimentary parallels with Michael Haneke’s “The White Ribbon,” and the stripped-down, doom-laden ambience echoes Bela Tarr’s “The Turin Horse.” But “From What Is Before” has a more sustained connection to its characters’ traumatic experiences. Each somber moment bleeds into the next, but the bigger picture matters, too: Small details established early on set the stage for major revelations hours later. The texture drives the narrative forward, so that Diaz ultimately creates the impression of a community shrouded from its surrounding society even as it closes in on them with horrific indifference. Diaz’s prolonged approach to storytelling is a tough sit with no easy payoff, but it enables him to cast a remarkable spell defined by a recurring sense of dislocation. Much like Claude Lanzmann’s “Shoah” explored the Holocaust exclusively through barren images from the present, Diaz relies on empty fields and the hints of ominous forces lurking just outside the frame. His characters aren’t oblivious to their woes. “The problem is neglect,” the priest says in one revealing moment. With time on his side, Diaz gives that assertion a physical dimension. Despite the historical context, “From What Is Before” amounts to a greater statement on the decay of rural existence. In the movie’s concluding two hour stretch, after the armed forces arrive in the barrio, the full nature of their presence takes hold with a final unsettling twist. As the president’s declaration of martial law is broadcast over radio waves, we see soldiers celebrating his announcement, fully aware of the victims we’ve spent so much time getting to know. It’s a profoundly terrifying climax. “Hell is coming,” decides one downtrodden villager, but Diaz leaves no doubt that it has already arrived. “From What Is Before” may not end on a hopeful note, but by resurrecting a time long past, the filmmaker triumphs by getting the last word. “From What Is Before” premiered this week at the Locarno Film Festival.